What are the names of the different teeth in your mouth? How does your body fight colds? What do blood cells do? Follow a friendly blood cell and find out. For answers to lots more questions about your body, click on the playlist. How long are your ear and foot, and how tall are you? Measure yourself, then compare yourself with other animals. What are the names of some bones inside your body? How many muscles do you have and what do they do? Why is there salt in your tears? What are the mumps? Answers to more questions about your body. How many body parts do you know? 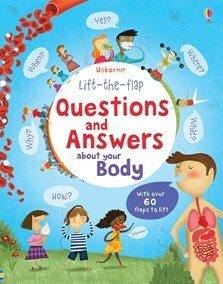 This bite-sized Q&A book with informative illustrations is sure to satisfy inquisitive minds, answering the kinds of questions young children have about their bodies in a fun lift-the-flap style. ...children (who have a zillion and one questions) can look through the book, and really dig into their anatomy revealing all the wonderful (and sometimes quite gross) nuggets of knowledge about their physiology. Best Children's Book I've Purchased This Year!